I’ve visited five Caribbean islands over the past few years and the rooms and facilities here are as nice as anything I’ve seen anywhere. Overall, very clean and very well-maintained. For an all-inclusive, the food is good with lots of choices and variety. Thanks to Claudius, Jenelle, Oshin, Janice, LaTisha for their excellent service. Fabian and Jermaine were great at the Hibachi. Fagan and Lacey at the Gift Shop are also great ambassadors for the resort. We spent two days at the Spa. Luxurious setting with lots of amenities, including mineral pools, steam rooms and a juice bar. Ackeem at the desk was very friendly and genuine. Ophelia showed us around and was also great. The therapists were top-notch, including Marshell and Loretta. As for the pools, the seating fills up fast. Both pools have bars and the drinks are good. As for the beach, lounge chairs were plentiful. It’s a private beach with a man-made cove, so the water is great for relaxing in. They also had free kayaks and hobies that you could take out during the day. Kemar took us on a hobie ride, he really enjoys his job. If you are assigned a butler, ask for Rueon and Carville. Both are great and are eager to provide service. There was enjoyable entertainment nightly. Silver Birds steel drum group, Howard Folds, Flashback Party and Jamaican Street Party were highlights. The entertainment staff does a great job, they all clearly enjoy what they do. We highly recommend this excellent place! Where to find Montego Bay hotels near an airport? Where can I find hotels in Montego Bay that are near tourist attractions? 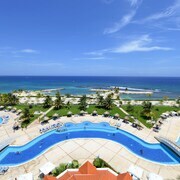 Montego Bay has a wide selection of quality short- and long-stay accommodation possibilities to choose from. Expedia has at least 83 accommodation options within 0.1 kilometres (0.06 miles) of downtown Montego Bay. Convenience is important when it comes to hassle-free traveling, so check out the Altamont West Hotel and Polkerris Bed & Breakfast, all of which are a short distance of Montego Bay's heart. Hip Strip is an area that is 2 kilometres (1 mile) from the heart of Montego Bay and has the largest selection of Montego Bay Expedia-listed establishments. The Royal Decameron Montego Beach - All Inclusive and Deja Resort - All Inclusive are amongst the Expedia-listed hotels in Hip Strip. Alternative areas with a range of hotels are Ocho Rios and Runaway Bay. The Sandals Royal Plantation All Inclusive and Hermosa Cove Villa Resort and Suites are in Ocho Rios, while Runaway Bay is where you'll find the Franklyn D. Resort & Spa All Inclusive and Jewel Paradise Cove Resort, All Inclusive, Curio by Hilton. St. Ann's Bay is 75 kilometres (47 miles) from Montego Bay's downtown, while Boscobel is 100 kilometres (63 miles) from central Montego Bay. 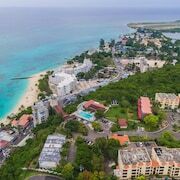 The Seacrest Beach Hotel and Teresinajamaica are in St. Ann's Bay, while Beaches Ocho Rios,Spa,Golf,Waterpark Resort - All Inclusive and Golden Cove Resort are located in Boscobel. If you would like to book a place to stay that is situated close to the Doctor's Cave Beach, the Sandals Montego Bay - All Inclusive and the Sandals Inn All Inclusive can be nice choices. The Sandals Montego Bay - All Inclusive is 3 kilometres (2 miles) away from the Doctor's Cave Beach. The Sandals Inn All Inclusive is 0.4 kilometres (0.3 miles) away. The Montego Bay area has some lower-priced accommodation options sure to delight thrifty travelers. The Grand Palladium Jamaica Resort & Spa All Inclusive is 25 kilometres (15 miles) from the center of Montego Bay, while the RIU Ocho Rios All Inclusive is 80 kilometres (50 miles) away. 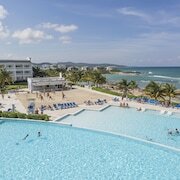 Two other Montego Bay hotels in the cheaper range include the RIU Montego Bay All Inclusive and the Jewel Runaway Bay Beach & Golf Resort All Inclusive. The Half Moon Royal Villas can be found 11 kilometres (7 miles) away from downtown Montego Bay. Another accommodation option is the Sandals Royal Caribbean & Private Island All Inclusive, which is positioned 7 kilometres (4 miles) away. Some more places to stay in the Montego Bay area include the Half Moon and the Secrets Wild Orchid Montego Bay - Luxury All Inclusive. Rose Hall is 11 kilometres (7 miles) to the northeast of Montego Bay and is where you'll find Blue Diamond Shopping Centre and Whitter Village. 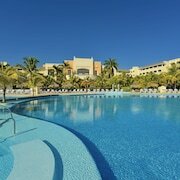 Rose Hall hotels include the Hilton Rose Hall Resort and Spa - All Inclusive and Coyaba Beach Resort & Club. 50 kilometres (32 miles) to the southwest of Montego Bay, you'll also find West End, which is home to the The Caves Hotel and The SPA Retreat Boutique Hotel. The Negril Cliffs and Negril Watershed Environmental Protection Area are just some of the more popular points of interest to explore when visiting West End. Sir Donald Sangster International Airport can be found 3 kilometres (2 miles) from Montego Bay. If you choose to stay close by, can easily book a room at the Riu Palace Jamaica All Inclusive - Adults Only or the Secrets St. James Montego Bay - Luxury All Inclusive. 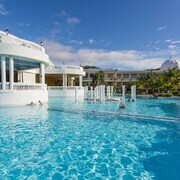 What are the most popular Montego Bay hotels? Are there hotels in other cities near Montego Bay? What other types of accommodations are available in Montego Bay? Explore Montego Bay with Expedia.ca’s Travel Guides to find the best flights, cars, holiday packages and more!